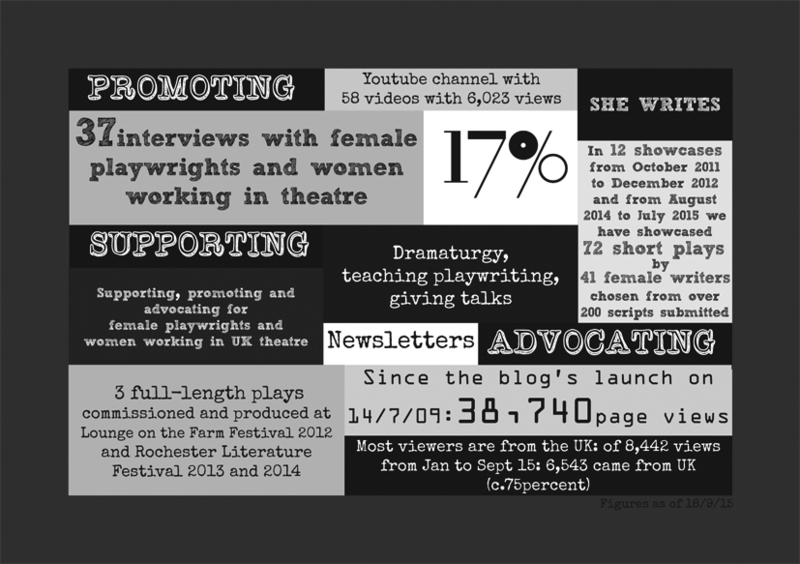 17Percent is an organisation set up to support and promote UK-based female playwrights, though we also promote and support women working in all fields of theatre making, and script writing. It is a totally unfunded voluntary initiative. 17Percent was set up by playwright Sam Hall in 2009. While taking writing courses, including an MA in Creative Writing, she noticed a significant imbalance in the number of women to men. In a class of 20, for example, there would be only about 4 men. But the majority of the plays studied on these courses were written by men; and the majority of plays performed at UK theatres were written by men. So why weren’t all those women who set out studying playwriting going on to have work performed and published? Men have been accepted as creators of art for much longer, so that any woman who now succeeds within this structure is credited with being a ‘woman in a man’s world’, and may feel that in order to succeed in this world she has to be even more ‘masculine’ than a man. Women in positions of power do not necessarily work with other women, any more than men do. There is also a much bigger body of work by men to choose from, as historically most writers have been male. The ‘canon’ is almost exclusively male. 17Percent aims to invite you to discover female playwrights from centuries past with our The Behn Legacy section (in development). Writing doesn’t pay very well, and unless you have a benefactor, or supportive partner, you can’t afford to develop your writing. There are not so many grants or funds for writers available now, and many of those focus on writers under 40, or younger. Writers need to network and be visible to the commissioners, (like in the arts in general,) once you’ve been commissioned once, you are likely to be commissioned again, but getting that first commission is hard to do. A number of other factors may also contribute, such as women taking time off for family, which means starting a career later, or simply not being commissioned as often. Women might not be getting commissioned as often as men, since their work might be viewed as desirable primarily for a “women’s” audience. Perhaps women don’t send their work out ‘on spec’ as easily – anecdotally we’ve been told only about 1 in 5 scripts received at The National Theatre is by a woman. Perhaps this all looks bleak; but just because we are looking at a long history of male dominance in art doesn’t mean we should just accept the status quo. We should do everything we can to try and even up the score. Equality is what 17Percent is about. She Writes – our script-in-hand showcase events have shown the work of over 40 writers. The showcase was launched in London in our Mini-Festival in 2010, and from 2011-2012 held our regular She Writes event in Whitstable every two months. We also run a sporadic She Writes night as part of a live literature residency at Roundabout Nights in Chatham which started in June 2014. Many of the writers featured at She Writes have gained confidence and taken their work forward and we keep in touch with them and promote their work. We have also produced 4* reviewed full-length theatre shows; She Writes: What’s through the door at the Canal Cafe in London, and at The Rochester Literature Festival in 2013, and The Spirit of my Dream for the Rochester Literature Festival in 2014. We also took shows to Lounge on the Farm, and we part of the Whitstable Bienale festival in 2012. 17Percent founder, Sam, has spoken on television and on panels in this country and at the Women Playwrights International Conference in Sweden in 2012, about female playwrights and women in theatre. She has also written a number of guest magazine articles on the subject. 17Percent interviews playwrights and theatre practitioners and their responses have made a fantastic resource of theatre making knowledge – which we have made available for free on Youtube and this blog. And why is this important? Drama is important as it gives us a plan for living. If all stories are about men and told by men, we keep seeing the same story; we get used to a dominant male view. Our showcases give women a voice and the opportunity to share stories from a female perspective, and show positive role models onstage to both women and men. We will support and promote female playwrights primarily through showcases with opportunities for feedback; mentoring opportunities; feedback and dramaturgy; championing women’s achievements in the theatre; and, providing positive female role models and inspirations. Our events will not for women only. We believe that to achieve equality, women and men should work together: in a conversation not a competition. The key aim of 17Percent is to widen the debate about why women aren’t getting their work produced and help more women get more of their work performed in the UK. We also aim to decrease the gender imbalance in UK theatre through positive interventions, working with other like-minded organisations and theatre practitioners. We produce She Writes showcases and various one-off performances. We offer an occasional email subscription newsletter with news, reviews, interviews and writing opportunities – click here if you want to subscribe. You can find back issues in various formats in the DOWNLOADS section. We have an online video resource on YouTube full of interviews with ‘interesting and inspiring’ playwrights and women who work in the theatre, or women have some good advice to share; some of those who have generously shared their advice are: Van Badham (then, Finborough Theatre); Gill Kirk and Samantha Ellis (playwrights); Alison Mead (Three4All); Gemma Lloyd (Act Up); Nancy Hirst (Icon Theatre); and expert in women in business, Dr Suzanne Doyle-Morris. If you would like to share your knowledge, please drop us a line. This blog is full of news, views and interviews. Good luck for your campaign. It’s a worthwhile debate and I would add that there are always groups of writers who are seemingly marginalized. It’s a complex issue to explore – for instance, I’m a female playwright but I’m also in my 40’s. A double whammy! Hello! I’m doing a research paper on why women are so underrepresented in the world of playwriting. I was wondering if you could send me any sources you might have! it would really help me out. Thank you so much!